The television shows, Robot Wars and its less destructive spin off, TechnoGames were extraordinarily popular and still have massive cult followings. In Robot Wars teams of contestants build their own remote controlled robots, which then attempt to shove, smash or otherwise destroy each other, ably assisted by the show's house robots, Shunt, Matilda, Dead Metal, Sergeant Bash, and Sir Killalot. In Techno Games teams built robots to compete in Olympic type events such as swimming, rope climbing, and javelin throwing - a little like a robot version of our Sodarace (see page 13). 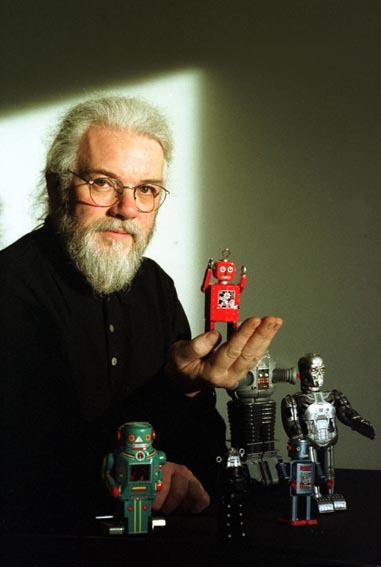 The shows have a lot in common, robots obviously, both were produced by Stephen Carsey then at Mentorn TV, and both had human judges to ensure fair play. One of the most popular judges on both was Professor Noel Sharkey of the University of Sheffield. 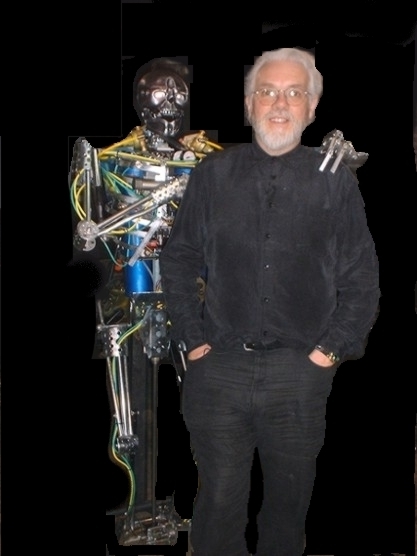 His research background in robotics and his easy-going sense of humour made him a favourite with viewers. We caught up with a very busy Noel who agreed to do an exclusive interview for cs4fn. 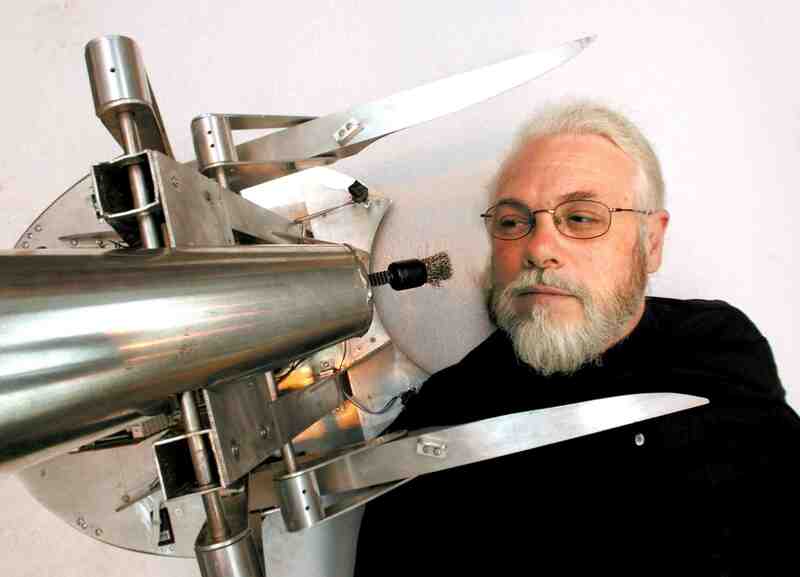 What was it like working on robot wars and TechnoGames? It was an amazing experience. The most exciting aspect was that it opened a window of communication for me with the public and allowed a dialogue about science and engineering. It also gave me a chance to really get to understand how TV works. Over 16 series of Robot Wars (including the international ones not seen here) I had the opportunity to spend time with camera operators, lighting people, sound engineers, producers, directors and a variety of presenters. Of course I enjoyed the competitions as well - especially TechnoGames. Many of the competitors were such creative engineers it was a sharp learning curve for me. What was your most disastrous moment on robot wars? It is difficult to think of the most disastrous moment as there were many. In every single series I felt that the judges had made at least one terrible mistake. We tried our best to be as objective and fair as we could, but this was a highly pressurized situation. We could take as long as 45 minutes making a decision with an audience of 2000 people and a bunch of TV people breathing down our necks. Because of time pressure we had to rely on other people's reports about damage and this was sometimes not as accurate as it could be. I don't want to mention names here but in a very tight match, we were once told that the object we could see in the arena was the motor from Robot A when we found out later that it was the wheel from Robot B and it was much too late to change the decision. These are the kinds of little things that I lose sleep over. What was your most successful moment? most of the big heavy looking roboteers were real pussycats off screen. The greatest moment that stands out for me was a kid's Robot Wars made specially for Nickelodeon in the USA. I had long been arguing with the producers about changing the immobilisation rule. That is, if even one motor stops working for at least 30 seconds, the robot is considered to be immobilized and it automatically looses. For me immobilized means that the robot has lost its mobility but I was unsuccessfully putting pressure on the production team to change the rule. Anyway, the wheels on this kid's robot stopped turning in the middle of the competition and the house robots were sent in to finish it off. This started one of the funniest and most gratifying chases that I have ever seen. The robot had two lifting spikes at the front and it used these like crutches to hobble round. What was so good was that it managed to completely evade the house robots for twenty minutes and one of them ended up in the pit. My face said it all when the producer came to talk to me about it and the immobilisation rule was changed. Do you think that robots have a future as TV celebrities themselves hosting game shows just like the Dr Who version of the Weakest Link? Yes, I don't think that it would be too speculative to have a robot TV presenter. I actually worked on a kids TV programme with a robot presenter a year ago but the BBC decided not to commission it - they have really turned sour towards robots. As I said in my pitch at the time, a robot is perfect as a presenter as the main job of many presenters is to read an auto-cue while following a set route on the floor and looking into the correct camera. The robot would have no trouble remembering its lines and it will exactly follow the route that it is told to. The real issue is in giving it a personality. 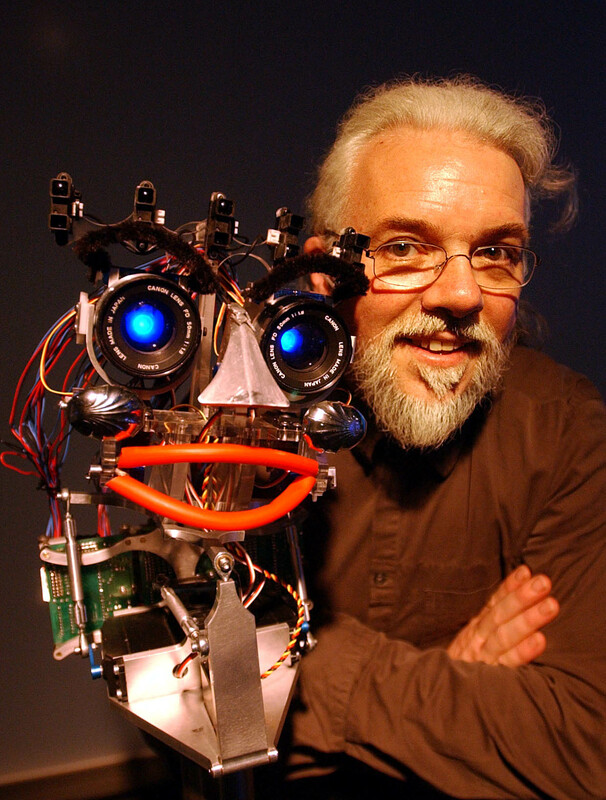 You designed an emotional robot - can robots ever really have emotions? There are a number of gestural or expressive robots around at present that can convey some of the language of human emotion. There are basically five emotions that everyone on the planet (without some mental affliction) agrees upon and can recognise: angry, sad, happy, disgusted and surprised. If you mix this with a chatty robot it will look quite convincing. But expressing emotion and feeling emotion are quite different things for a machine. I personally can't see how an inorganic object will ever feel or be aware of anything. There is a very long and technical argument behind what I am saying but I don't want to bore your readers senseless. How did you become a Science celeb? That is like a trick question. I don't view myself as a science celeb or any other kind of celeb (although I desperately wanted to be a famous rock guitarist in my youth). My passion is to communicate some truths about science and engineering to the general public that we should all know. I am just really lucky to have had the opportunity of a little TV fame to help me on my mission. If someone wanted a career designing and building robots how would they go about it? The standard answer is to take engineering, science and maths subjects at school, take an engineering degree and then get a job in the robotics industry. But my advice is to just get stuck in. There is plenty of advice on the Internet and there are a lot of little clubs and competitions around if you spend a bit of time looking. If you like building things and want to be creative, hit the scrap yards where you can buy a lot of cheap motors for windscreen wipers, windows or seats as well as gears axels, batteries and odd bits. If you are more interested in the artificial intelligence side, buy a kit robot (or even Lego Mindstorms) and learn how to program it. We have got to a point in technological history that might later be thought of as a golden age of robotics. How could you make the applications of robotics of more interest to girls? Robotics appears to be one of the bits of engineering that females are most interested in. Certainly a number of leaders in the field in the academic world are women. When I was running final year projects in computer science at Sheffield most of the few women did my projects. I wont even begin to speculate on why this might be as one of my five daughters may read it and cut my head off. But I can say that it has something to do with the multidisciplinary aspects of combining engineering, electronics and artificial intelligence. I think that there were not so many women teams in Robot Wars because of the perception of testosterone-fueled aggression. I say "perception of" because most of the big heavy looking roboteers were real pussycats off screen. What current research projects in robotics do you find most inspiring and why? No, and another question with the same answer might be "Could a robot tell a lie?" To be honest, I have always been interested in everything. My family used to call it fads. One week I would be obsessed with my little microscope and the next it would be learning some instrument - I am sure that it was frustrating. My interest in science was particularly inspired by a TV programme that I used to watch in the 1950s - I can't remember what it was called - that had a nuclear physicist as one of the main characters. So that is what I wanted to be. You can claim to be a psychologist, engineer, philosopher, cognitive scientist, linguist, artificial intelligence researcher and computer scientist. Why so many subjects? It isn't really a "claim". These are the fields that I have worked in and taught. The main reason why so many subjects is because I got back into academia in the first place to find out how my mind worked and then how the mind worked in general. The obvious starting place was psychology and it took me quite a few years to work out that they did not have the answers that I was looking for and I had to look elsewhere. I think that I must have turned over nearly every stone in psychology while looking. So I was forced to look elsewhere and I have to say that after nearly 40 years of searching. I don't know any more about it than when I started but I do know about a lot of blind alleys. That is really how scientific endevour works. It is like a giant maze where many unsung heroes spend their lives eliminating possibilities. Were you inspired by a famous scientist or engineer? Oh, yes. By more people than I could name here. I got my very first great intellectual hero when I was working at Wood Green station learning how to assemble trains. I read a book called "The lives of the great mathematicians" and became fascinated by Archimedes, his mathematics and his engines of war. I loved the way he did not respect subject boundaries. You spend a lot of time at the Magna Science Adventure Centre. Are museums fun? Museums are potentially a great place to conduct research. The essence for me is that it allows me to do two of my favourite activities at once. It allows me to do robotics research without having to worry about some industrial application at the end of it and it means that the public gets to see scientific work in the raw as it is happening, warts and all. Of course to work and be informative it has to be entertaining and dramatic as well. What do you think is special about the slime we are made of? There are so many ways that I could answer this (and have done) but let me answer it with another question here. Why as a scientist should I be bothered with this "fairy tale" question? For some reason, during the foundations of AI, scientists pulled a fast one on us that wrong footed the issue ever since. In the normal course of science, the theorist puts forward novel hypotheses that test the theory. The emphasis is on making a test strong enough to falsify the theory convincingly. When the test does not lead to falsification it provides a confirmation that will be part of an accumulation of tests that can eventually lead to acceptance of the theory (for now). With Artificial Intelligence, we are given, instead, an in-principle argument that combines the idea that we are machines ourselves with minds that compute and the point that anything that is computable can be computed by a computer (by definition). The problem for me is that there is no evidence that our minds work like computers in the first place. The other problem is that there is not one shred of evidence that any machine anywhere has ever felt anything or seen anything (cameras record an image, they don't "see"). You will hear some scientists saying, "I know that machines can think because I can think and I am a machine" without showing any realization of the circularity of what they are saying. It reminds me a little of the faulty logic in the syllogism, All Greeks are mortal, all humans are mortal, therefore all humans are Greek - get it? Here it is again with the right terms, All humans are machines, computers are machines, therefore computers can think I will get off my soap-box now.